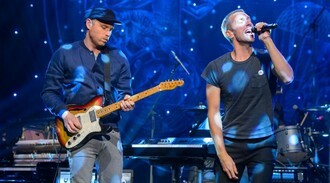 Coldplay will get in good practice for their finale set at this year’s Glastonbury Festival as they bring the NME Awards with Austin, Texas to a close with a foot-stomping romp through their biggest hits. The four piece will pick up their Godlike Genius award at the ceremony on Wednesday, just one day after being announced as the first band to headline Glastonbury four times, and will play a career-spanning set. Joining in the celebrations will be Yoko Ono, who is picking up the Inspiration Award at this year’s event at Brixton’s O2 Academy just hours before she turns 83. There’ll be more than a few surprises for the audience at the annual music awards, including waiting to hear if Kanye West will win the hero and villain of the year gongs, having been nominated for both. He joins politicians in the shape of Donald Trump, six-times nominee David Cameron and Chancellor George Osborne, plus radio host Chris Moyles and X Factor judge Simon Cowell on the list for villain of the year. But his nomination for hero of the year lauds him alongside Adele, Taylor Swift, Dave Grohl, Florence Welch, and token politician, Labour leader Jeremy Corbyn. Adele’s return has been nominated for music moment of the year, competing with The Libertines’ secret Glastonbury set, Dave Grohl carrying on a Swedish concert after breaking his leg, Florence + The Machine headlining Glastonbury (after stepping in to cover for Grohl’s band Foo Fighters), Kanye at the Brits and One Direction’s hiatus. Poor One Direction will also be waiting to hear if they take home worst band of the year, which pits them against U2, Little Mix, Nickelback, 5 Seconds Of Summer and Sleaford Mods. Leading the award nominations with six each are Wolf Alice and Pete Doherty’s band The Libertines, who released third album Anthems Of Doomed Youth after a break of more than a decade. Both have nods in the best British band, best live band and best track categories. Hot on their heels with four nominations each are Foals and The Maccabees, who will also be performing at the awards. Adele takes on Noel Gallagher, Ed Sheeran, Charli XCX, Welch and Skepta for best British solo artist. Before their closing set, Coldplay will find out if they have picked up the trophy for best track for Adventure Of A Lifetime. It competes against The Libertines’ Gunga Din, The Weeknd’s I Can’t Feel My Face, Skepta’s Shut Down, Wolf Alice’s Giant Peach and What Went Down by Foals. BBC Radio 1 DJ Huw Stephens will host the ceremony.